King Felipe is implementing a variety of reforms within the Spanish Royal Household to promote transparency and prevent corruption, according to media reports. His Majesty is prohibiting members of the Royal Family from working in the private sector. His sisters, members of the Royal Family before his proclamation, have both had jobs. The King is also adding new controls for gifts, sending the Royal Household accounts to independent auditors and adding legal advisers. King Juan Carlos, King Felipe’s father, is known to have accepted lavish gifts from other monarchs. Reforms stem from a corruption investigation involving Infanta Cristina and her husband. She has denied wrongdoing. 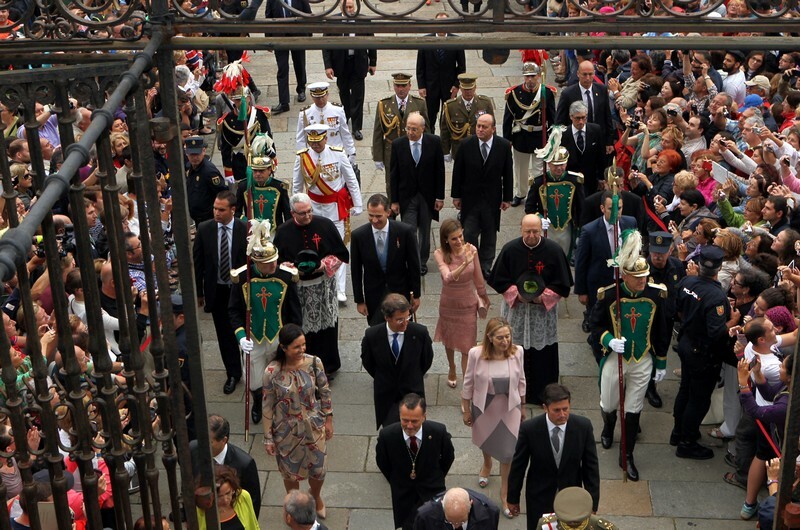 Instead Infanta Elana and Infanta Cristina are no longer members of the Royal Family. King Felipe’s rise effectively bumped them out. They are now considered members of the King’s Family. 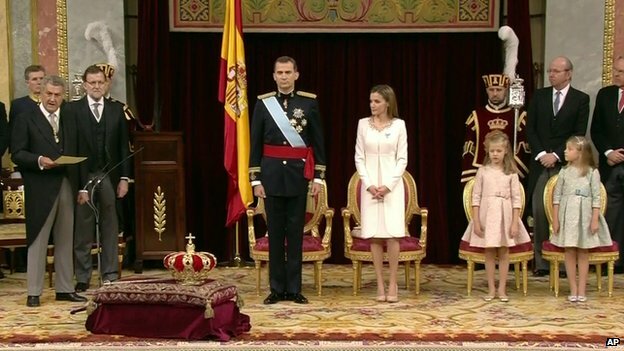 Members of the Royal Family are now King Felipe, Queen Letizia, King Juan Carlos, Queen Sofia, Infanta Leonor and Infanta Sofia. 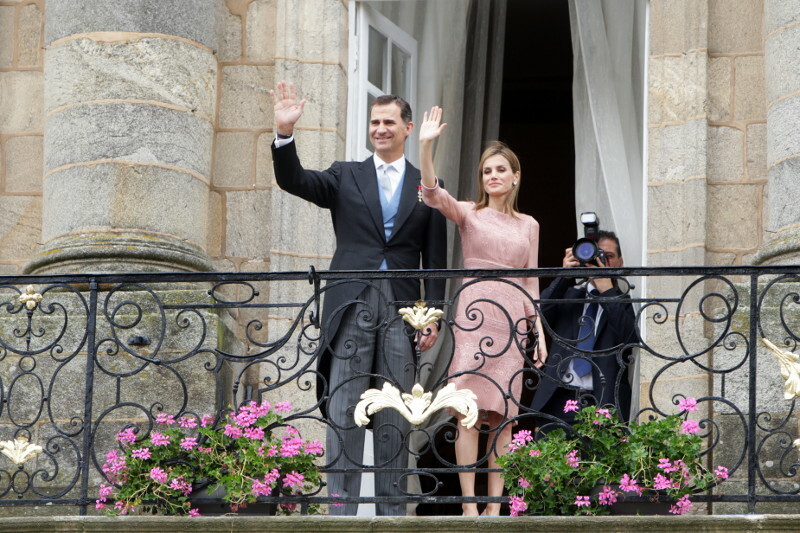 King Felipe and Queen Letizia sought to highlight Spanish-French relations during an introductory visit to that the neighboring country this week. French President Francois Hollande hosted a lunch in honor of Their Majesties after a meeting. 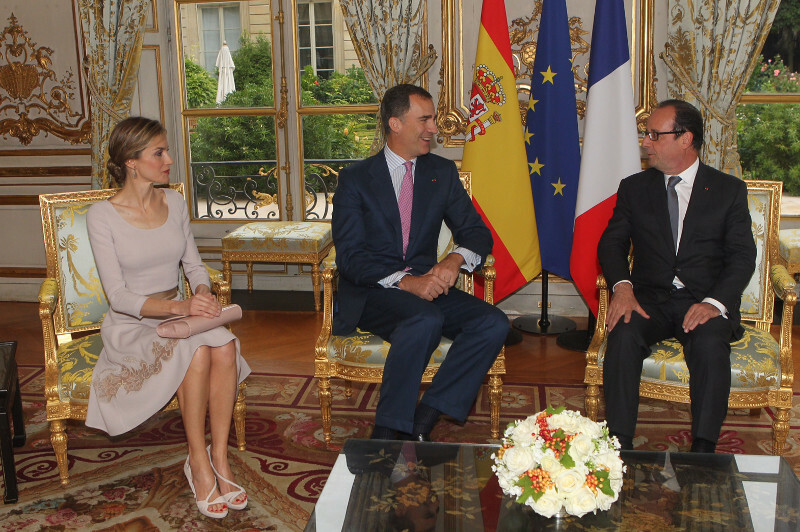 King Felipe’s remarks touted Spain’s close relationship with France, both being among the oldest countries in Europe. 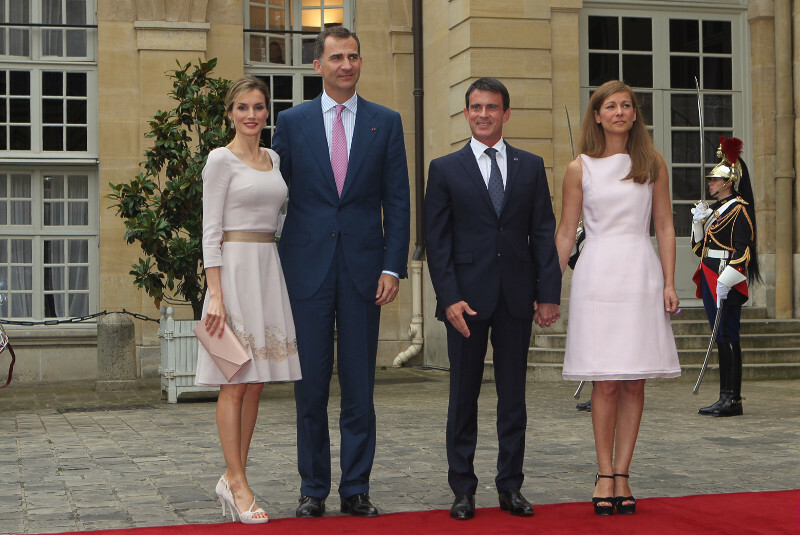 King Felipe and Queen Letizia also met with other French officials, including new Prime Minister Manuel Valls, who was born in Barcelona. 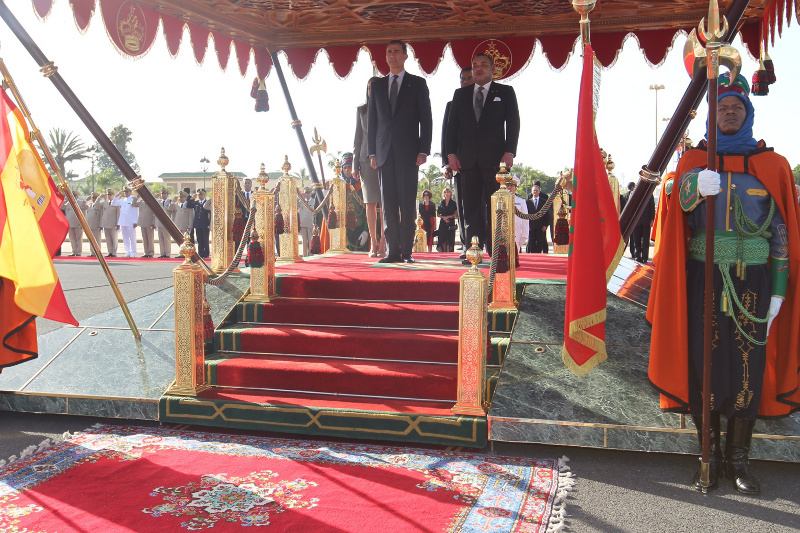 King Felipe and Queen Letizia yesterday finished a two day introduction trip to Morocco. The stop by Their Majesties to the nearby Kingdom was the second international trip since they rose to power. The first was to see the Pope in Vatican City. King Mohammed presents King Felipe and Queen Letizia with the Collar of Wissam Al Mohammadi. King Felipe’s father, King Juan Carlos, worked for decades to maintain good relations with Morocco. The two countries have numerous issues in common, including the former Spanish colony and now disputed Western Sahara territory, plus two remaining Spanish enclaves in Africa. Both countries often cooperate on issues of terrorism and immigration. 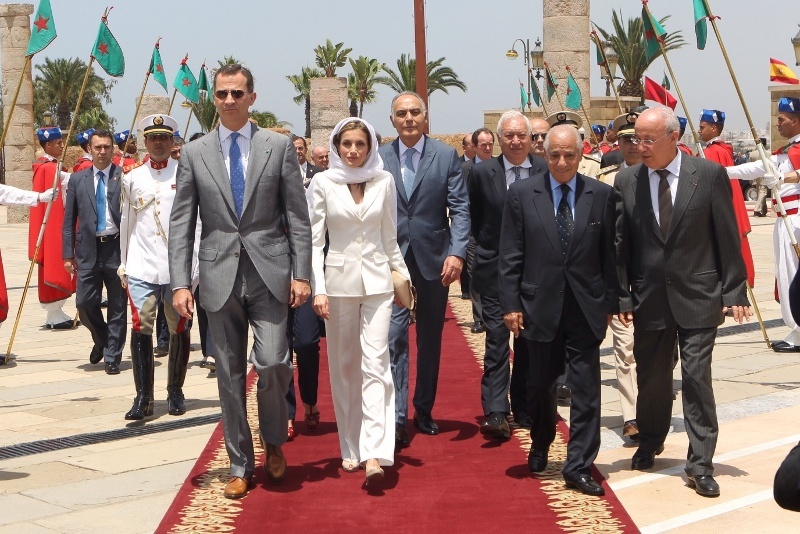 At the Mausoleum of King Mohammed V.
Separately, the Royal Household confirmed to Spanish media outlets that King Felipe and Queen Letizia will follow royal tradition and vacation in Palma de Mallorca for at least a few days this summer. Queen Sofia is a big fan of staying in Palma and Marivent Palace, but Queen Letizia is less keen on spending her vacation in the public eye. King Felipe VI has decided that political appointees can be sworn in without a Bible and crucifix, as has has been long-standing tradition, media outlets are reporting. 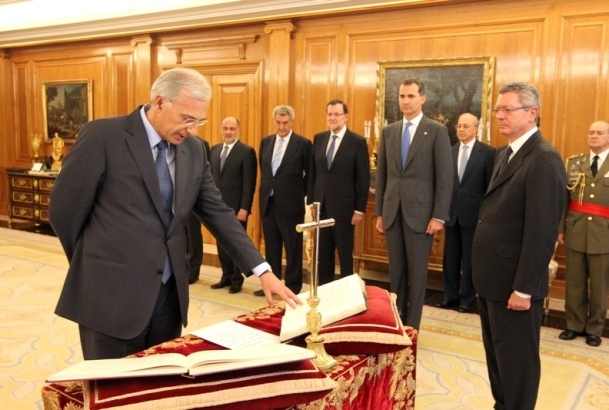 King Felipe swears-in new Constitutional Court magistrate at Zarzuela Palace. King Felipe has decided that the Bible and crucifix are optional, as a way of promotion freedom of religion as enshrined in the Constitution. Don Felipe’s recent proclamation as King was different from his father’s in that it didn’t include a crucifix. Prince Felipe proclaimed King in 2014. 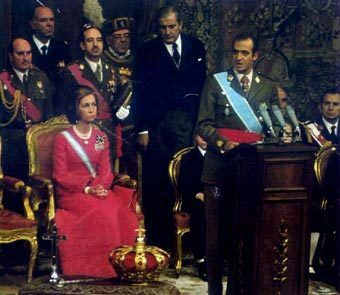 Prince Juan Carlos proclaimed King in 1975. Former Spanish dictator Francisco Franco, a fierce Catholic, used to display large crucifixes for events. It has been a busy week for King Felipe and Queen Letizia. It started with a short but whirlwind trip to Portugal, which included visits with the country’s leaders and civil society. 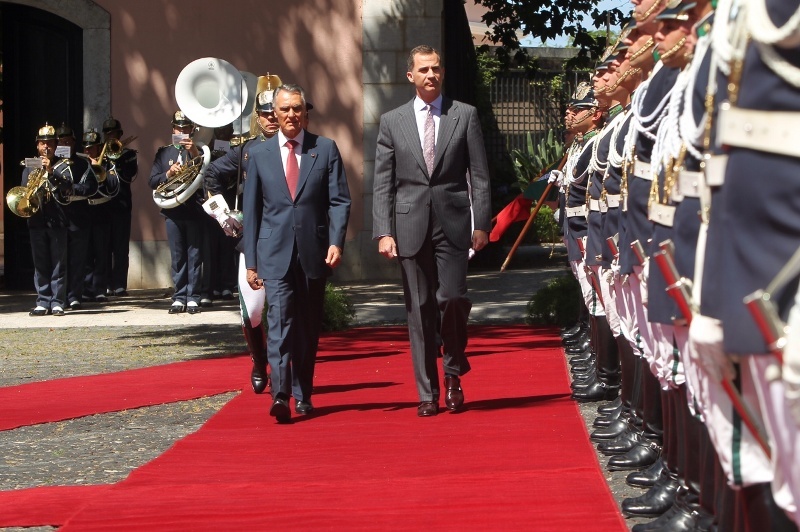 King Felipe and President Silva. Queen Letizia with Portuguese First Lady María Cavaco Silva and Paula Cost, president of the Portuguese National Association of Mental and Rare Diseases. This week King Felipe attended the wake for Spanish soccer legend Alfredo Di Stéfano Laulhe at Madrid’s Bernabéu Stadium. 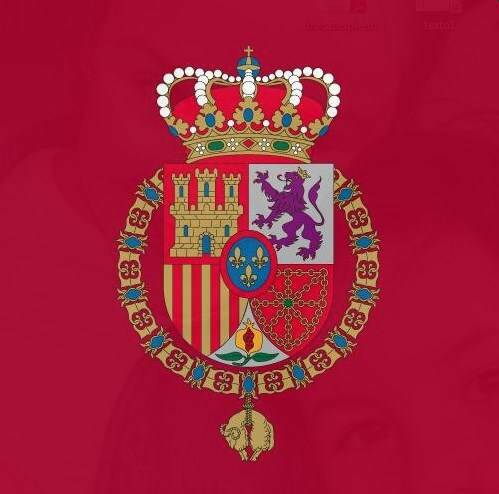 Queen Letizia, King Juan Carlos and Queen Sofia also sent their condolences. Queen Letizia gets mobbed by crowds during a Spanish Red Cross event. The King also attended military and institutional ceremonies this week. 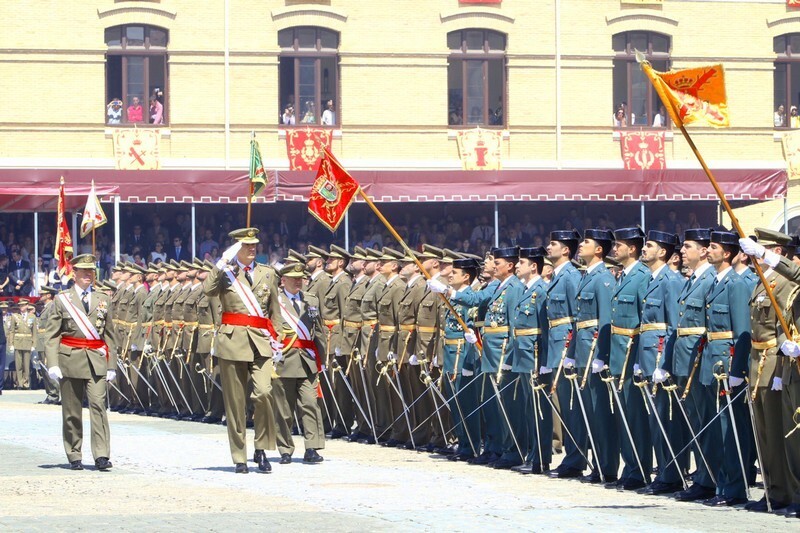 King Felipe granting Royal Dispatches at the Zaragoza Military Academy. Tomorrow the King will host a meeting of Spain’s National Security Council at Zarzuela Palace, the first of his reign. Even though most of the attention has been on the new Monarchs, Queen Sofia, King Felipe’s mother, made an appearance at the Valencia Nautical Club this week. It was not on the Royal Household’s official agenda. 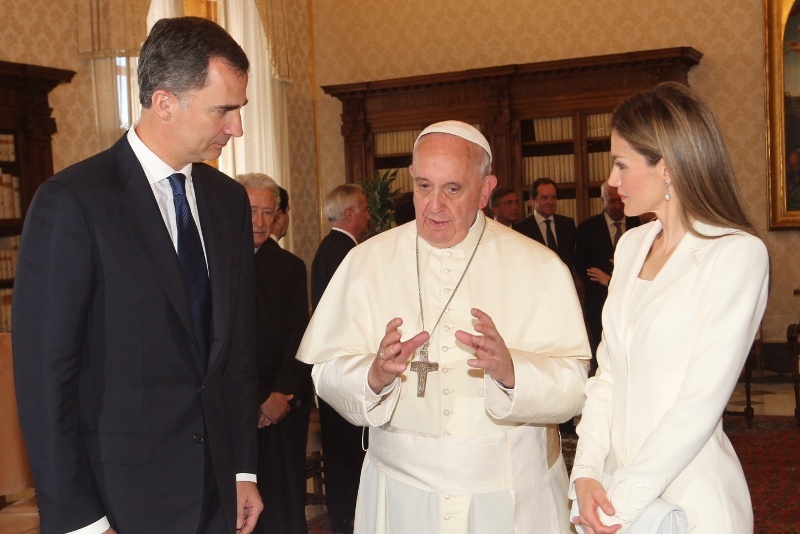 King Felipe and Queen Letizia this week were in Vatican City to meet with Pope Francis. The trip was part of the new Monarchs’ ongoing effort to meet with world leaders. Even though Spain has strong secular institutions, the Monarchy retains the tradition of closeness to Catholic leaders. 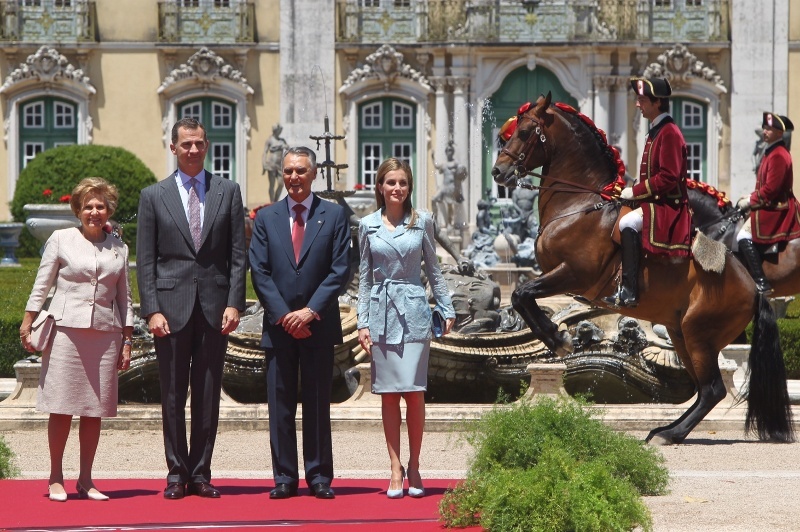 King Felipe and Queen Letizia will next week make a trip to Portugal.